TDN INVOLVES MULTIPLE ADVANCES OF A SMALL NEEDLE INTO THE MUSCLE IN THE REGION OF A “TRIGGER POINT”. THE AIM OF DRY NEEDLING IS TO ACHIEVE A LOCAL TWITCH RESPONSE TO RELEASE MUSCLE TENSION AND PAIN. IT IS AN EFFECTIVE TREATMENT FOR ACUTE OR CHRONIC PAIN WITH VERY FEW SIDE EFFECTS. A HEALTHY MUSCLE FEELS VERY LITTLE DISCOMFORT WITH INSERTION OF A NEEDLE. IF A MUSCLE HAS ACTIVE TRIGGER POINTS, THE INDIVIDUAL WILL FEEL A SENSATION LIKE A MUSCLE CRAMP OR POSSIBLY A REPRODUCTION OF THEIR PAIN. THE RELEASE MAY FEEL LIKE A DEEP ACHE, OR PERHAPS A BURNING SENSATION. THIS RESULTS IN A DEACTIVIATION OF THE TRIGGER POINT, REDUCING PAIN, IMPROVING MOBILITY, AND RESTORING NORMAL FUNCTION TO THE INVOLVED MUSCLE. A MYOFASCIAL TRIGGER POINT IS TENDER “KNOT” IN THE MUSCLE TISSUE. THESE POINTS ARE LOCATED IN MUSCLES THROUGHOUT OUR BODIES. WHEN ACTIVE, THE TRIGGER POINTS CAUSE PAIN REFERRAL. FOR EXAMPLE, A TRIGGER POINT IN THE BUTTOCK CAN CAUSE PAIN DOWN THE LEG AND MAY POSSIBLY BE MISTAKEN FOR SCIATIC PAIN. TRIGGER POINTS CAN BE PERPETUATED BY THE WAY YOU SIT, THE WAY YOU SLEEP, THE WAY YOU LIFT, THE WAY YOU RUN, A CAR ACCIDENT, SURGERY, ETC. 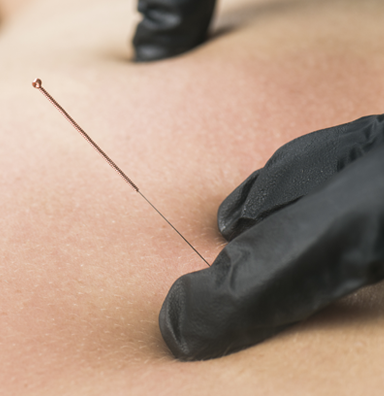 WHAT CAN I EXPECT AFTER A NEEDLING SESSION? IT IS NORMAL TO FEEL SOME MUSCLE SORENESS FOR A DAY OR TWO AFTER NEEDLING, SIMILAR TO SORENESS AFTER EXERCISE. THIS IS A NORMAL RESPONSE. IT IS HELPFUL TO APPLY HEAT TO THE AREA LATER IN THE DAY, DRINK LOTS OF WATER, AND TAKE IBUPROFEN. WHAT CONDITIONS ARE EFFECTIVELY TREATED WITH TDN? HOW IS TDN DIFFERENT THAN ACUPUNCTURE? ACUPUNCTURE IS BASED ON RESTORING FLOW OF ENERGY (“chi”) IN THE BODY. WITH TDN, THERE IN NO INTENTION OF AFFECTING THESE ENERGY PATTERNS. TDN IS BASED ON MODERN WESTERN SCIENTIFIC PRINCIPLES AND WORKING KNOWLEDGE OF ANATOMY AND PHYSIOLOGY. THE MUSCLES THAT HARBOR TRIGGER POINTS ARE NEEDLED. RESEARCH HAS SHOWN THAT TDN IMPROVES BLOOD FLOW TO THE AFFECTED AREA AND INCREASES CHEMCIAL SUBSTANCES THAT HELP TO BUILD NORMAL TISSUE IN THE REGION. Soft tissue injuries can be debilitating and frustrating. Graston Technique® (GT) is successful in effectively treating all soft tissue conditions, whether they are chronic, acute or post surgical. Graston is a type of instrument-assisted soft tissue mobilization, which enables clinicians to address scar tissue and fascial restrictions that are impeding normal function. The non-invasive technique uses specially designed stainless steel instruments to help the clinician identify and treat areas exhibiting soft tissue fibrosis or chronic inflammation. As the instruments are moved over the affected area and come in contact with the adhesions, they help break up scar tissue and fascial restrictions. In time, this process will reduce or eliminate the adhered fibers, restoring range of motion and eliminating the associated pain and dysfunction. It will help transform injured or restricted soft tissue into healthy functioning tissue. The benefits of Graston include decreased overall time of treatment, reduced use of anti-inflammatory medications, reduced recovery time and even resolve of chronic conditions once thought to be permanent. GT does not need to be considered "painful" to be effective. Patients usually receive two treatments per week during a four-to-five week period. Most patients have a positive response by the third to fourth treatment. The effectiveness of the Graston Technique® is founded in research. Research conducted by Graston Technique® trained clinicians at Ball Memorial Hospital and Ball State University in Muncie, Ind., found that the controlled micro-trauma induced through the Graston Technique® protocol, increased the amount of fibroblasts to the treated area, triggering the healing of injured soft tissues. Graston Technique® is accepted nationwide by elite athletes and everyday patients, as one of the most effective treatments for rehabilitation and range of motion maintenance, especially when combined with other treatment modalities. If you would like to learn more about the clinical efficacy of the Graston Technique®, please go to their website, which offers many research-based articles for your review.